The Content Grabber proxy API enables other applications to access Content Grabber at runtime. 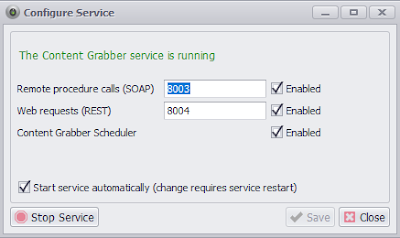 Then in the following window enable the Remote procedure calls (SOAP) on port 8003, We request (REST) on port 8004 and Content Grabber Scheduler. Finally check Start service automatically. You will see the message: "The Content Grabber service is running." In this example, the API endpoint will run only on our local machine (i.e., it will not be available publicly on the Internet). Therefore, in Application Settings→API Access, you can uncheck "API key required," so we do not need to send API key everytime you made the request. If Content Grabber service located on a remote machine, you can replace localhost to the IP address of the server (please ensure you properly secure access to that machine either via firewall or using an API key). The port number for web requests is 8004 by default. Now let's look at the web request used to execute Content Grabber agent. The following request will run the agent synchronously and returned the data in JSON format. The name of the agent and full path can be used here. If you add the name of the agent, Content Grabber will look for it in the default location in your local system. If you have saved your agent in a different place, then you need to provide the exact path. The timeout value is the maximum number of seconds you want your agent to run. By default, this value is 30 seconds. 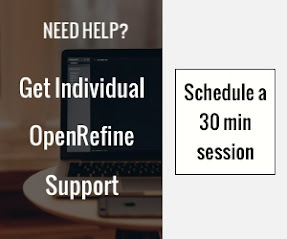 if you don't set up this value, your agent will automatically stop and close its session after 30 seconds. If your agent requires input parameters, you can send them in JSON formatted list of input parameters that should be URL encoded. Input parameters let you configure the agent at runtime. 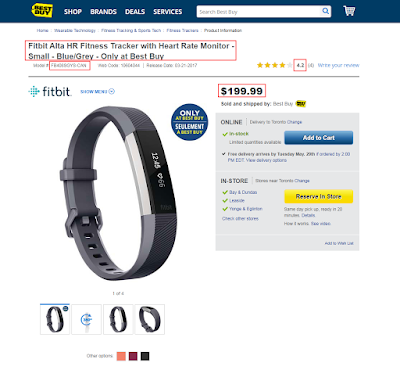 For example, we can search for a specific item in an online catalog or phone registry. 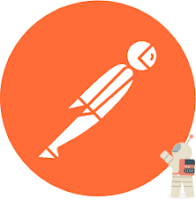 We will use Postman to test web requests. Postman is a Google Chrome application for communicating with HTTP APIs. It has a user-friendly GUI for making requests and reading responses. The agent is built to accept input parameters to search for a specific product. I will send the name of that specific product as an input parameter. 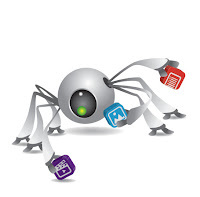 Content Grabber will first search that product by name then extracted the desired data. 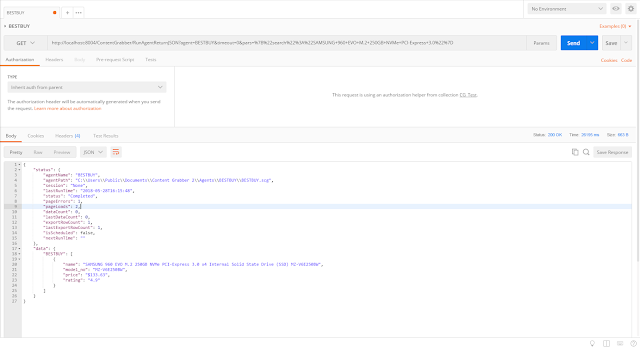 Open postman select GET HTTP method. Enter your request, now click save and give a name to your request. After giving name, select collection folder where you would like to save it. We saved the two examples below in Postman documenter. Create a basic request and enter your web request. I have used the IP address of the machine where Content Grabber is installed instead of localhost. Below is the response that I have received. There is no need to open Content Grabber to run the project and collect information if it is called by API. Now, let's change the input parameter to scrape the data for another product. Again you can view and run those queries from postman from here. 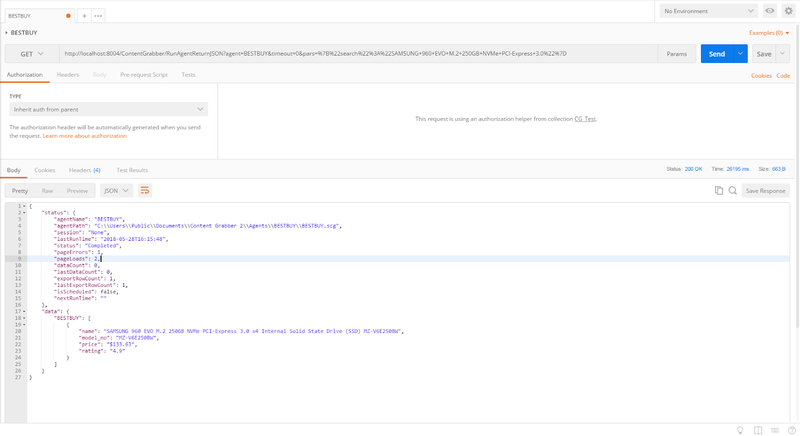 In this tutorial, we saw that Content Grabber let you quickly and easily build webscraper and start and configure them via a web API. Now you can build your own web application based on using web data extraction and scale it to handle multiple request at the same time.